LightCounting has published a new report and forecast, focused on integrated circuits used in optical transceivers. 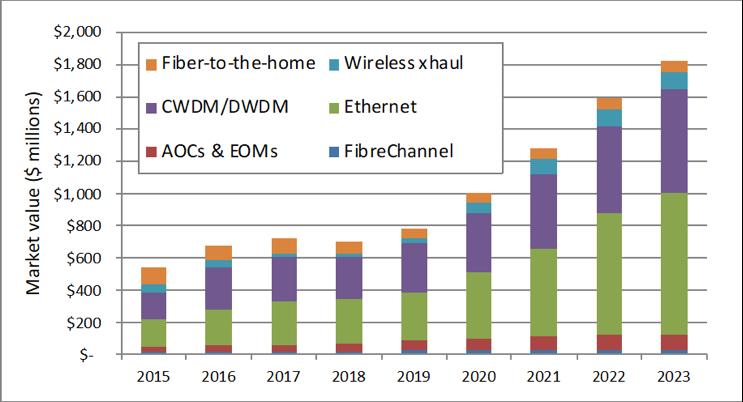 One of the main conclusions of our analysis is that, after several years of stagnant growth, the market for optical interface IC chipsets is heading into a high-growth period, with a CAGR of 24% from 2019-2023. Sales of coherent DSP chips for DWDM optical interfaces and PAM4 DSPs for Ethernet transceivers will account for most of the revenue growth in this market, as can be seen in this chart. Coherent DSP sales grew rapidly in 2015-2016, but excess inventory accumulated by customers in 2017 and the ZTE shutdown in 2018 put a damper on growth in more recent years. Suppliers reported improving demand for coherent DSPs in late 2018, with ZTE back in business and sales of new 200G CFP2 DCO and 600G board mounted modules beginning. Guidance for the first quarter of 2019 was strong as well. The first sales of PAM4 DSPs for applications in Ethernet transceivers started in 2018. Demand for PAM4 DSPs used in 200GbE and 400GbE transceivers is expected to be very strong in 2019, as key customers start deployments of these modules in mega datacenters. The use of 400GbE optics on core routers will also contribute to market growth in 2019. Although coherent DSPs were well ahead of PAM4 chips in sales in 2018, we expect that the gap will shrink in 2020-2023, as PAM4 shipments reach 10x higher volumes than coherent DSPs. Coherent DSPs will maintain the lead in revenues, however, since PAM4 chips will be used to address cost sensitive markets, and price declines will be much steeper than for coherent DSPs. Competition between coherent and PAM4-based products will be the most intense in the 40 km reach 100GbE and 400GbE applications. The 100GbE ColorZ module developed by Inphi for interconnecting Microsoft’s datacenters was the first PAM4-based solution with 40km reach. Longer reach 100GbE coherent competition is getting a boost via the IEEE standards being developed for coherent 40km and 80 km transceivers. Our new report and the accompanying forecast spreadsheet provide additional analysis of the IC chipset opportunity related to optical transceivers, and was developed in consultation with and with assistance from many different communications IC manufacturers. We look forward to discussing this new topic with clients, and look forward to your feedback.